Ultem® is a family of Polyetherimide (PEI) products manufactured by SABIC, and can be further classified as an amorphous thermoplastic. Ultem® resins are used in medical and chemical instrumentation due to their heat resistance, solvent resistance and flame resistance. Ultem has high mechanical properties and performs in continuous use to 340°F (170°C). 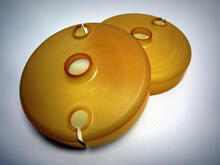 Ultem® is a semi-transparent high strength plastic material that can operate in high service temperature environments. Ultem® is resistant to hot water and steam and can withstand repeated cycles in a steam autoclave. Ultem® has outstanding electrical properties, with one of the highest dielectric strengths of any thermoplastic material. Ultem® is often used instead of polysulfone when superior strength, stiffness, or temperature resistance is required. Vanderveer Industrial Plastics specializes in CNC machining for plastics, like Ultem®, to close tolerances. Ultem® is available in glass-filled grades with enhanced strength and stiffness. Vanderveer Industrial Plastics has been supplying and machining sheet, rod, and tube to close tolerances for over 60 years. Trust us with your Ultem® machined parts. Several grades of Ultem® are available. For additional information on Ultem® plastic materials, contact your local Vanderveer Industrial Plastics representative or call Vanderveer Industrial Plastics at 714.579.7700.